For our latest mixtape we welcome one of the UK’s more unique electronic producer, Two Inch Punch to the fold. 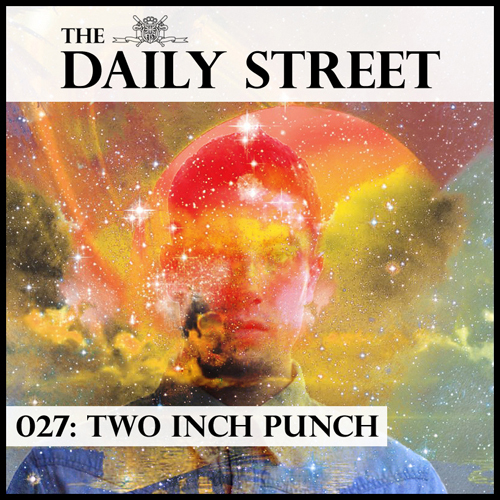 Two Inch Punch is one of those producers who seems to slip half way between the classic producer/DJ and an electronic band/act. His music is very unique and although it fits into a selection of DJ friendly genres and scenes, it also stands out all on it’s own at the same time. It’s this element of his music not quite fitting in anywhere, but fitting in everywhere at the same time that makes Two Inch Punch much more of an artist rather than another electronic producer. This mix is a great example of that unwillingness to follow the usual rules and regulations. At only 27 minutes long, it’s our shortest mix to date, but it’s also one of our most varied in regards to style, genre and tempo, somehow smoothly transitioning from genre to genre and slipping in the odd classic R&B banger such as Tweet’s “Oops (Oh My)”. It’s a great reflection of TIP’s influences to his own R&B soaked galactic sound and makes for one of our most diverse mixes to date. If you’re new to the world of Two Inch Punch, we highly recommend you check out his previous two releases on PMR (home to Julio Bashmore and Jessie Ware amongst others), Love You Up EP and Saturn: The Slow Jams EP. In the mean time, check out the mix below and enjoy. I wanted to play some new things I am listening to that I wouldnt play out in a club that have a soulful feel to them. I dont like to stick to BPMs either. I am a massive fan of the Santigold remix of ‘Lady’ by Benny Blanco one of my favourite remixes ever. What did you do this mix on? Serato Itch using a Novation Twitch. Yeah for sure. Clothes are a big thing for me. Particularly after a pair of original KCK Duffs right now. I like Lazy Oafs new line. “I am a massive fan of the Santigold remix of ‘Lady’ by Benny Blanco one of my favourite remixes ever.” I actually hate Benny Blanco for making that remix so short. One of his best works clocks in at a little under 2 minutes long.